Daniel Edward Murtaugh (October 8, 1917 – December 2, 1976) was an American second baseman, manager, front-office executive and coach in Major League Baseball best known for his 29-year association with the Pittsburgh Pirates as a player and manager. He threw and batted right-handed. Danny Murtaugh's number 40 was retired by the Pittsburgh Pirates in 1977. 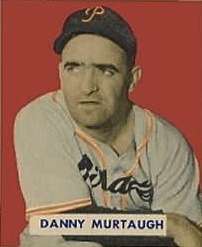 A native of Chester, Pennsylvania, Murtaugh played during nine seasons for the Philadelphia Phillies (1941–43, 1946), Boston Braves (1947) and Pittsburgh Pirates (1948–51). As a rookie, he led the National League in stolen bases with 18. He was a .254 career hitter with eight home runs and 219 RBI in 767 games. His most productive season came in 1948, when he hit .290 and posted career highs in RBI (71), runs (56), doubles (21), triples (5) and games played (146). In 1950 he hit .294, also a career-high. After retiring as a player, he managed the minor league New Orleans Pelicans and Charleston Senators before returning to the Pirates as a coach (1956 through August 4, 1957). He then succeeded Bobby Bragan as manager and would hold the job for all or parts of 15 seasons over four different terms (1957–64, 1967, 1970–71, 1973–76). Murtaugh guided the team to two World Series championships (1960, 1971) and four Eastern Division titles (1970–71, 1974–75). He first retired after the 1964 season citing health problems, moving up to the Pirate front office evaluating players for general manager Joe L. Brown. However, when his immediate successor as manager, Harry Walker, was fired during the 1967 season, Murtaugh returned as interim manager for the remainder of the season, after which he returned to the front office. Well aware of the abundance of talent in the system, Murtaugh asked to reclaim the managing job after Larry Shepard was fired in the last week of the 1969 season. Once medically cleared, he became manager once again. (Only hours after this re-hiring on October 9, Don Hoak, his third baseman on the 1960 world champion Pirates and a manager in the Pirates' farm system in 1969, died of a heart attack after believing he was a leading contender to manage the parent club.) He stepped down after the 1971 championship season and his hand-picked successor, Bill Virdon (center fielder for his 1960 world champions), took over. When Brown fired Virdon in September of 1973, Murtaugh reluctantly returned to managing and stayed through the 1976 season, both he and Brown announcing their retirements during the final week of that season. On September 1, 1971, Murtaugh was the first manager in major league baseball history to field a starting lineup consisting of nine black players (African Americans and Afro-Latin Americans). The Pirates beat the Phillies 10-7 in that game. As a manager, he compiled a 1,115-950 record in 2,068 games (.540), second in Pirates history behind only Fred Clarke. Murtaugh died in his hometown of a stroke at age 59, two months after retiring. His number 40 was retired by the Pirates on April 7, 1977. 1 2 "Danny Murtaugh". Baseball Reference. Sports Reference. Retrieved October 3, 2015. "Baseball Pays Its Respects to Murtaugh at Funeral", New York Times, Dec. 7, 1976. -Pittsburgh newspaper's tribute to Murtaugh as part of its 50-year anniversary of the 1960 Pirates team that won the World Series over the Yankees.